If you have tile and grout floors in Tampa FL, then you have probably wondered why your grout gets dirty so easily. And, more importantly, how to remove this dirt to make your tile floor look like new again. It is important to understand what grout is before finding a cleaning remedy. Grout is the material applied between tiles to fill the spaces and hold the tiles together. It is a rough and porous material, which collects dirt and grime easily. Since grout is absorbent, liquid substances can penetrate deep within the grout causing it to look discolored. This is often the case with tile flooring. One of the main causes for discolored grout is dirty mop water. Believe it or not the mop water you use to clean your floors spreads the dirt from the tile into the grout. This is compounded by the fact that your grout is the lowest part of the floor, and this is where the dirty mop water settles. Cleaning your floor can actually add dirt to your grout. Dirty grout is a source of bacteria, mold, and mildew. Once grout is stained, it is very hard to restore the grout to its original appearance. It’s important to have your grout professionally cleaned every 12 to 18 months depending on the amount of soil. Professional grout cleaning services ensure that grout stays in good condition for decades. They can also provide other tile and grout based services such as color sealing to change the look of your tile floor while adding protection from dirt and grime. Most Professional tile cleaners carry appropriate consumer cleaning products that can add life to your tile floor. Tile floors although durable withstand an enormous amount of traffic within a home. Every time someone walks on a tile they transfer dirt and germs to the tile and grout. Therefore, it can be quite a daunting task to keep your floors looking clean. With the help of a professional, you can achieve the look of sparkling clean floors and feel confident that your home will be healthy and radiant. 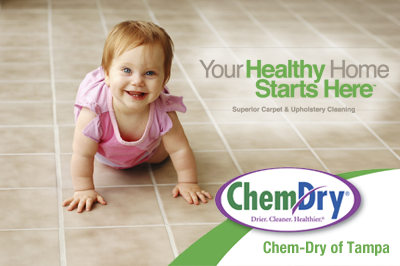 Chem-Dry professionals use specialized cleaning solutions and powerful suction equipment to blast away and remove the dirt from your tile and grout. Your Chem-Dry of Tampa FL technician will then apply a durable sealant that helps protect against dirt and other particles that can tarnish the look.